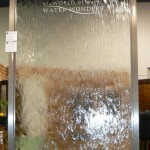 Glass is a very popular material used in floor fountains and water walls. The glass is used as the facing material that the water runs down. The glass is typically clear, but there are often options for tinted or mirrored options. Glass can provide a little more flexibility due to its transparent nature. Light shines through allowing you to use the fountain in more open areas of the room, without making the room feel smaller. This is especially true with a larger water wall. Like many other larger fountain options, glass may be personalized with a logo, either by etching the glass or applying a vinyl decal.